Troglobytes Games have announced through a recent press release that they will be launching a Kickstarter October 10th for their upcoming game, HyperParasite. HyperParasite is a roguelike-like, twin-stick shooter with a unique body snatching gimmick allowing the player to jump from host to host with each body providing a different play style. It will feature an 80’s inspired aesthetic and a synth-wave soundtrack, and can be played single player or in co-op. 4th October 2018, Barcelona, Spain – Today indie studio Troglobytes Games is excited to reveal that their crowdfunding campaign on Kickstarter, for rogue-lite, twin-stick shooter, HyperParasite, will commence October 10, 2018. 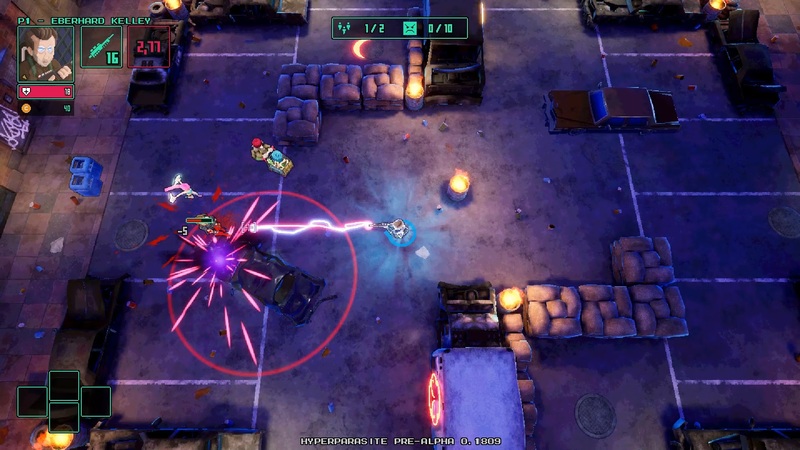 With work well underway, Troglobytes Games has earmarked a 2019 release, the developer seeks to raise a modest $29,000 to accelerate development, and to aid the porting to consoles. An intense and frantic co-op mode: can the humans handle TWO HyperParasites? HyperParasite is set in the 80s, offering rad visuals, fast paced action and tight controls. The onscreen cast of characters, 60 different classes, all of which you can control, exploiting their own attributes, weapons and moves, present a game of outrageous action, rip roaring brawling at is very best, laced with a comical slant which adds spice and fun! No more looking for weapons, it’s the dude you control that is packed with the boom!